These are links to websites relevant to archaeology in general, and KAFS courses in particular. Going to the dentist today is like spending the day at the spa, at least compared to dentistry thousands of years ago... Read more on the link above. OUR GRATEFUL THANKS TO THE MORROW COMMUNITY CENTER FOR SENDING US THIS LINK! Archaeological Photography Scales available from Adam Stanford at Aerial Cam. Email Adam at the address above for more information. This link was found by one of our younger up-and-ccoming archaeologists whilst celebrating Florida Archaeology Month - thank you Sofia! This is the website of William Lord. William is an accomplished flint knapper, and runs courses demonstrating the techniques involved. The Council for British Archaeology produces the magazine 'British Archaeology', runs the 'Britarch' mailing list, and provides a starting point for any number of online resources. The new website for the CBA in the South East, focussing on local archaeology. The Council for Independent Archaeology, organised by Andrew Selkirk, publishes "Current Archaeology" magazine. Andrew has strong feelings about the impact of the Valetta Convention on amateur archaeology in the UK. See Dr Paul Wilkinson's comments in the KAFS magazine "Practical Archaeology", issue 4, for more information. This long-standing local society publishes "Archaeologia Cantiana" annually. The website of the Popular TV archaeology programme. 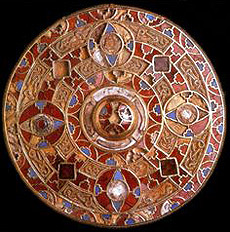 The Kingston brooch from Kent is one of the finest examples of the Anglo-Saxon jeweller's art.